SEPTA System Safety Director Scott Sauer demonstrates that electric trains are very quiet during the press conference held along the West Trenton Line. Rail fatalities, accidental and intentional, are a national problem. According to the Federal Railroad Administration, in 2012, there were 442 pedestrian trespass fatalities across the U.S. — 70% of those incidents occurred in 15 states, with California (74 deaths), Texas (32) and Pennsylvania (28) being the top three states. Sadly, Southeastern Pennsylvania Transportation Authority (SEPTA) has not been immune to this rash of rail-related fatalities. From January 2013 to April 2013, there were eight deaths involving SEPTA’s Regional Rail and Broad Street (subway) lines, putting the agency on a pace this year that could exceed the 12 deaths on all modes in 2012. But the majority of transit-related deaths are preventable, especially by following simple rules such as staying behind the yellow lines on platforms, never running for trains or vehicles and not trespassing in the track area. To combat the rise in fatalities and remind the public of the dangers of walking along, playing by or cutting across its train and trolley tracks and through its rail yards and depots, SEPTA held its first-ever Safety Awareness Day on May 1. 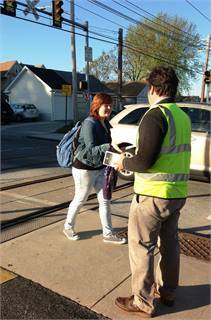 SEPTA Environmental Safety Officer Richard Harris hands safety information to a student heading to a school located near SEPTA’s Leamy Avenue trolley station. 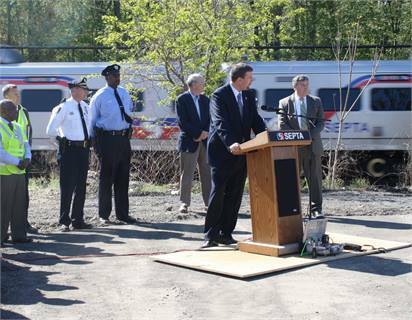 GM Joseph M. Casey and System Safety Director Scott Sauer held a press conference at a lot along SEPTA’s West Trenton Regional Rail Line, in an area where too many people make the illegal and dangerous choice of walking along the tracks. SEPTA’s Safety Awareness Day is unprecedented — this is believed to be the only such all-out endeavor by a U.S. transit organization. But for the agency, this isn’t a one-day event — safety is part of the SEPTA culture every day. With more than one million riders traveling on its 2,200-mile service area every day, SEPTA is committed to providing a safe travel environment for its passengers. But one of the goals of Safety Awareness Day was to reach all members of the public with the safety messages. Read our METRO blog, "My APTA Bus Roadeo Experience" here.